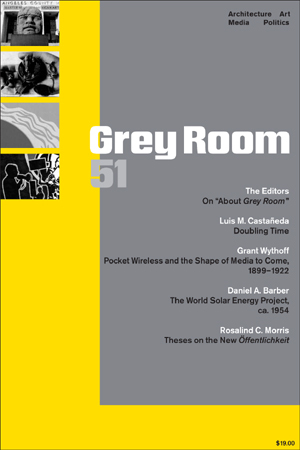 Cover of Grey Room 51 (MIT Press, 2013). The new website for the journal Grey Room is a means to extend the reach and scope of the print publication by taking advantage of the unique capacities of the Internet and digital media. The website allows the journal to reach new audiences, particularly outside of North America, and moves the journal toward the increasingly open culture of academic exchange that is fostered by digital media. Selected articles from the journal are available for free download; additional, original editorial material not available in the print version is accessible free of charge; and the site hosts discussion forums and allows the journal to publish time-based media in digital formats. John Harwood, associate professor of art for modern and contemporary architectural history, Oberlin College, focuses on the architectural articulation of science, technology, and corporate organization. He is the author of The Interface: IBM and the Transformation of Corporate Design, 1945–1976 (University of Minnesota Press, 2011). His articles and reviews have appeared in Grey Room, AA Files, Journal of the Society of Architectural Historians, Perspecta, Design and Culture, and do.co.mo.mo journal. Lucia Allais, assistant professor of architecture, Princeton University, is a historian and theorist who specializes in architecture's intellectual and political history since the Enlightenment, with a focus on international networks and institutions in the twentieth century. She has worked in design firms in Europe and America, including OMA-AMO and 2x4, and is a member of the Aggregate architectural history collaborative. Her current book project, Designs of Destruction, traces the rise of a new political aesthetics in mid-twentieth-century international organizations, and its spatialization through the work of experts who were charged with protecting monuments from the combined destructive effects of war, modernism, and modernization. Zeynep Çelik Alexander, assistant professor of architecture, University of Toronto, is an architectural historian who focuses on the histories and theories of modern architecture since the Enlightenment with an emphasis on German modernism. After training as an architect at Istanbul Technical University and Harvard Graduate School of Design, she received a PhD from the History, Theory, and Criticism Program at Massachusetts Institute of Technology. Alexander is currently completing the book Kinaesthetic Impulses: Epistemologies of Aesthetic Modernism circa 1900. Eric de Bruyn, lecturer in modern and contemporary art, Leiden University, is a prolific historian and critic of twentieth-century art, with particular expertise in the history of experimental cinema and other time-based media. He has published widely in Europe and North America, including in the journals Artforum, Texte zur Kunst, and Grey Room. Trained as an anthropologist, Gabriella Coleman, Wolfe Chair in Scientific and Technological Literacy, Department of Art History and Communication Studies, McGill University, researches, writes, and teaches on hackers and digital activism. Her first book on Free Software, Coding Freedom: The Aesthetics and the Ethics of Hacking was published by Princeton University Press (2012). She is currently working on a new book on Anonymous and digital media under contract with Verso. She has given numerous talks on hackers, digital activism, open source production and intellectual property law. Noam Elcott, assistant professor of art history, Columbia University, specializes in the history of modern art and media in Europe and North America, with an emphasis on interwar art, photography, and film. His research and teaching combine close visual analysis with media archaeology and critical theory. He also writes and teaches on contemporary art. He is currently at work on a book-length study provisionally titled Artificial Darkness: An Art and Media History, 1876. Benjamin Young is a doctoral candidate in rhetoric at the University of California, Berkeley, and managing editor of Grey Room. He teaches at the New School, works with Arts & Labor, and has contributed articles to Grey Room and Sensible Politics: The Visual Cultures of Nongovernmental Activism among other publications. Kathleen Oginski, graphic designer and design director of Grey Room, is a professional graphic designer, and was a member of the board of trustees of Massive Change. Grey Room, Inc., was founded in 1999 with the purpose of starting a journal dedicated to the theorization of modern and contemporary architecture, art, media, and politics.